While drilling of new gas wells in the Marcellus and Utica Shale plays has fallen recently, industry experts expect renewed activity over many years once prices rebound. To help drilling communities and the states of Pennsylvania, Ohio, and West Virginia get the response to drilling right in the future, the Multi-State Shale Research Collaborative (MSSRC) today released two documents: Lessons from the Gas Patch: A Local Government Guide for Dealing with Drilling; and A Report Card on Shale Gas Policies in Ohio, Pennsylvania, and West Virginia, which grades three states on nine fiscal, social and economic policies related to fracking. The MSSRC is a project of the Pennsylvania Budget and Policy Center, the West Virginia Center for Budget and Policy, and Policy Matters Ohio. Lessons from the Gas Patch distills lessons for local communities from MSSRC case studies on four drilling counties (two in PA, one each in WV and OH) and from statistical analysis on the social impacts of fracking in drilling-intensive counties. The Report Card grades state policies in nine areas such as whether the state has effective policies for growing in-state Shale jobs, mitigating the boom-bust character of extraction, ensuring supplies of affordable housing, taxing the shale industry, and tracking health impacts. The report card does not address environmental impacts. All states get at least one F but any state would achieve a solid report card if it adopted in each area the policies of the state with the highest grade. Achieving the “honor roll” would require lifting some grades above those currently received by any of the three states. Read more by clicking here. You can view the reports by clicking here and here. The MSSRC claims to be non-partisan and independent, but it has been pointed out by some that the organization is funded by anti-drilling groups such as the Park Foundation and counts among its leadership a former president and CEO of the anti-drilling group Penn Future. Eclipse Resources Corporation (NYSE: ECR) (the “Company” or “Eclipse Resources”) today is pleased to provide the following operational update, revised capital expenditure plan for 2016 and amended guidance. Energy Transfer Equity, L.P. (NYSE:ETE) (“ETE” or the “Partnership”) today announced that it has terminated its merger agreement with The Williams Companies, Inc.(“Williams”) effective June 29, 2016. As previously announced, on Friday, June 24, 2016, the Delaware Court of Chancery issued an opinion finding that ETE is contractually entitled to terminate the merger agreement with Williams in the event ETE’s counselLatham & Watkins LLP (“Latham”) were unable to deliver a required tax opinion prior to the June 28, 2016, outside date in the merger agreement. Latham advised ETE that it was unable to deliver the opinion as of the outside date. Consistent with its rights and obligations under the merger agreement, ETE subsequently provided written notice terminating the merger agreement due to failure of conditions under the merger agreement, including Latham’s inability to deliver the required tax opinion, as well as the other bases detailed in ETE’s filings in the Delaware lawsuit referenced above. Williams has appealed the decision by the Delaware Court of Chancery to the Delaware Supreme Court. View the entire release by clicking here. Williams does not believe ETE had a right to terminate the Merger Agreement because ETE breached the Merger Agreement by (among other reasons) failing to cooperate and use necessary efforts to satisfy the conditions to closing, including delivery of Latham & Watkins LLP’s Section 721(a) tax opinion. Accordingly, on June 27, 2016, Williams filed an appeal with the Delaware Supreme Court in connection with the Delaware Court of Chancery's June 24, 2016 ruling relating to the Merger Agreement between Williams and ETE. Williams recognizes the practical fact that ETE has refused to close the merger. Williams has concluded that it is in the best interests of its stockholders to seek, among other remedies, monetary damages from ETE for its breaches. So, while taking appropriate actions to enforce its rights and deliver benefits of the Merger Agreement to its stockholders, Williams will renew its focus on connecting the best natural gas supplies to the best markets. Williams remains well-positioned to meet the rapidly growing demand for natural gas and experience significant fee-based growth. Williams’ focus on fee-based revenue has produced strong cash flow, and looking forward, Williams expects continued growth from its portfolio of large scale demand driven projects and a fully contracted natural gas transmission business coming on in the balance of 2016, 2017 and 2018. The company behind the Keystone XL pipeline filed a $15 billion lawsuit Friday against the Obama administration under the North American Free Trade Agreement (NAFTA). TransCanada claimed that Obama spent seven years using “arbitrary and contrived” analyses and justifications to delay the pipeline for political reasons. TransCanada’s suit also says that the company had reason to believe that the pipeline would be approved before it was rejected by the Obama administration in November. President Barack Obama rejected the pipeline due to the perception among environmentalists that it would increase global warming. The Keystone XL pipeline would have increased America’s carbon dioxide (CO2) emissions by less than three-tenths of one percent of the country’s total annual CO2 emissions, according to analysis by the Environmental Protection Agency (EPA). The Community Bill of Rights Committee has once again exercised its democratic right to petition local government and put a charter amendment on the November 2016 ballot. The voters have again indicated via their petition signatures that they want to vote in November 2016, on whether or not to ban shale gas development (fracking, injection wells and other shale gas infrastructure) within Youngstown city limits and uphold their unalienable right to local control to protect their public health, safety, well-being and the democratic process. So you have a fringe group of people, selectively choosing studies and portions of studies to fit their agenda, while ignoring studies paid for by fellow activist groups because the results don’t align with said agenda, and completely disregarding the will of the people they say they are standing up for. Not to mention the whole fact that Ohio’s Supreme Court declared in 2015 that local governments cannot supersede state authority by banning oil and gas development. So, even if the ban were to pass after so many failed attempts, it would likely mean an expensive court proceeding to determine if its even legal, which by the Supreme Court’s definition it would not be. According to EID's research, this charter has also cost taxpayers over $16,000 each time it has been voted on, which means that this sixth vote would push the total cost to nearly $100,000 to keep having this appear on ballots. Anti-drillers have vowed to keep pushing for repeat votes as long as the measure keeps being defeated. Yale University researchers plan to take air and water samples from 100 Belmont County homes to determine how Marcellus and Utica shale fracking impacts the environment. Considering the many active drilling operations, pipelines and compressor stations one can find in Belmont County, the researchers may find plentiful data in the field. Nicole Deziel, an assistant professor in the Yale Department of Environmental Health Sciences, will serve as the study’s lead investigator. Deziel said she and three other Yale researchers will base their operations in the science lab at the Olney Friends School in Barnesville until they leave in August. “We are very interested in whether this expansion in natural gas extraction could contribute to the contamination of water and air supplies,” Deziel said. “Ohio is understudied. Most of the studies are from Pennsylvania or Texas. “We hope our results will advance understanding of the potential for exposure to volatile organic compounds and other toxic substances in communities with natural gas extraction by comparing concentrations of chemical contaminants in homes in close proximity to natural gas wells and homes located farther away,” Deziel said. For investors in Williams Companies (NYSE:WMB), Friday was a bad day for a reason other than Brexit. A Delaware court ruled that Energy Transfer Equity (NYSE:ETE) will be able to get out of its deal to acquire Williams, due to concerns about how the deal will be taxed. This should substantially affect Williams shareholders as the deal was made when energy prices were much higher, and Williams wanted to force the deal in order to help maximize shareholder value. Without the deal, however, Williams will still be fine and has a few paths forward. It is not a secret that Energy Transfer wanted out of the deal. When they made the merger agreement with Williams, energy prices were high and there was the projection for large synergies between both companies. Now with the substantial drop in prices, Energy is facing a cash crunch caused partially by the cash portion of the deal. Energy has offered previously to renegotiate the deal with Williams, as they were hoping that Williams shareholders would accept more stock compensation instead of cash. However, Williams has refused to budge. While a court usually doesn't allow a company to get out of a merger that it doesn't like, in this case there was a specific question before the court. The agreement between Williams and Energy contained a provision that would essentially let Energy walk away from the deal if the tax structure on the deal was not what Energy thought that it would be. While this is usually a routine matter, Energy's counsel refused to issue a letter addressing the merger as tax free. As a result, Energy has cited the tax issue as the reason that it wants out of the deal. Importantly for Williams, there is a $1.48 billion breakup fee should Energy back out of the deal. The court ruled that Energy's lawyers were acting in good faith in their belief that the tax structure was not as initially thought tax free. While Williams leaned heavily on the argument that this is just a ploy by Energy's attorneys to help Energy get out of a deal that it now regrets, the court found the issue differently. While it may look suspicious, there is very little evidence that this is the case, and it does appear as though this is an issue where Energy's attorneys found a problem in the deal structure, and were acting in good faith. Williams is expected to continue to try to do everything that it can in order to help make the merger go through at its current terms. As previously announced, the cash and stock elections will be subject to proration and adjustment procedures that are further described in the merger agreement between Williams and ETE (the “Merger Agreement”). Subject to those proration and adjustment procedures in the Merger Agreement, common stockholders of Williams had the option to elect to receive for each share of Williams common stock (other than Williams shares held by Williams, subsidiaries of Williams, Energy Transfer Corp LP (“ETC”) and its affiliates and shares for which the holder thereof has perfected appraisal rights under Delaware law) the right to: $8.00 in cash and 1.5274 common shares representing limited partner interests in ETC (“ETC Common Shares”) (the “Mixed Consideration”); or 1.8716 in ETC Common Shares (the “Share Consideration”); or $43.50 in cash (the “Cash Consideration”). * Holders of 248,375,417.456 shares of Williams common stock, or approximately 31.637% of the outstanding shares of Williams common stock, failed to make a valid election prior to the Election Deadline. Williams today also filed papers commencing an appeal in the Delaware Supreme Court of the Delaware Court of Chancery’s June 24, 2016 ruling relating to the Merger Agreement between Williams and ETE. While Williams appreciates the Court of Chancery’s consideration of this matter, Williams does not believe ETE has a right to terminate the Merger Agreement because ETE has breached the Merger Agreement by failing to cooperate and use necessary efforts to satisfy the conditions to closing, including delivery of Latham & Watkins LLP’s Section 721(a) tax opinion. Williams remains ready, willing and able to close the merger under the Merger Agreement entered into with ETE on September 28, 2015. If ETE terminates the Merger Agreement, Williams will take appropriate actions to enforce its rights under the Merger Agreement and deliver benefits to Williams’ stockholders. In the latest rebuke of the Obama administration’s expansive view of executive power, a federal judge has struck down the Interior Department’s effort to regulate fracking for oil and natural gas. Judge Scott Skavdahl of the District Court of Wyoming already had put a hold on the regulations last year, and in a decision released late Tuesday, he ruled that Congress did not give Interior the power to regulate hydraulic fracturing, indeed it had expressly withheld that power with some narrow exceptions. The judge dismissed particularly the claim by the Interior Department and its Bureau of Land Management that it had inherent broad regulatory authority to pursue the public good on federal and Indian lands, the only place the regulations would have applied. Attorneys for the federal government have appealed last week's ruling by a federal judge in Wyoming that the Interior Department's Bureau of Land Management (BLM) does not have the authority to enforce a rule governing hydraulic fracturing (fracking) on public and tribal lands. Last Tuesday, U.S. District Court Judge Scott Skavdahl ruled that fracking was outside the regulatory jurisdiction of the BLM and disagreed with the agency's assertion that Congress had given it broad powers, citing several federal statutes (see Shale Daily, June 22). An appeal to the Tenth Circuit Court of Appeals in Denver was filed last Friday by six attorneys for the federal government, including four from the Justice Department's Environment and Natural Resources Division. Kathleen Sgamma, vice president of government and public affairs for the Western Energy Alliance (WEA), told NGI’s Shale Daily that the organization anticipated the government’s appeal. Raymond James & Associates has increased its 2017/2018 West Texas Intermediate oil price forecast by $5.00/bbl, but cautioned that given the U.S. unconventional industry's ability to post efficiency gains, the bias over time is for prices to move lower. Specifically, the 2017 and 2018 forecasts for WTI have been raised to $80/bbl from $75. Brent prices for 2017 are expected to average $83/bbl versus an earlier forecast of $79, while in 2018, prices should average $80/bbl from $75. In 2019 and beyond, the forecast is for $70 WTI and $75 Brent. "Given the U.S. shale industry's ability to post steady cost efficiency gains, our bias would be that, over time, oil prices move lower, or the futures curve becomes backwardated starting in mid-2017," said analysts J. Marshall Adkins and Pavel Molchanov. "This $70 price deck should support sufficient long-term U.S. oil supply growth to offset slowly rising global oil demand and falling non-U.S. oil supply." At the beginning of 2016, Raymond James energy analysts had forecast WTI/Brent would average $75/$79. In early February, they had forecast WTI would reach $50/bbl later this year in the face of a futures strip that was considered "simply unsustainable" (see Shale Daily, Feb. 8). Global upstream development spend from 2015 to 2020 has been cut by 22% or US $740 billion since the oil price started to drop two years ago, according Wood Mackenzie's research. When we include cuts to conventional exploration investment, the figure increases to just over US $1 trillion. Malcolm Dickson, Principal Analyst at Wood Mackenzie says: "The impact of falling oil prices on global upstream development spend has been enormous. Companies have responded to the fall by deferring or cancelling projects and costs have also fallen. Our 2015-2020 forecast for capital investment has been reduced by 22% or US$740 billion since Q4 2014. In the nearer term the impact is even more severe: compared to pre-oil price fall expectations, capex will be down by around US$370 billion or 30% in 2016 and 2017." Wood Mackenzie expects to see further cuts throughout the year and investment levels continue to shrink as more projects are dropped and companies struggle to break even. A new building for North Township is just the latest contribution that a company operating the massive Harrison Hub natural-gas processing plant has made to this Harrison County community. The township building, located at 38170 Crimm Road, was dedicated last week at a ceremony attended by about 75 people, including local and state dignitaries and officials from M3 Midstream, which operates the Scio plant along with Williams Partners, a pipeline company. The structure is 56 feet by 80 feet, has five bays for equipment, a meeting room, bathroom, utility room and office for employees, said Dan Henry, chairman of the North Township trustees. Scio is located in North Township. "We can't thank them enough," Henry said. "We're a small township in a small community. We would never be able to afford this. If we tried this, it would create such a tax burden. You just can't do things like that in this small community." North America's oil and gas industry is "coming off the bottom," but the recovery is unlikely to be a straight line, Halliburton Co.'s financial chief said Tuesday. CFO Mark McCollum spoke Tuesday at the Wells Fargo West Coast Energy Brokers Conference, where he discussed the failed merger bid for Baker Hughes Inc. and the Houston company's strategy moving forward. "We think at this point in time in the cycle in the market...we're coming off of the bottom...at least in North America and [we're] approaching a bottom internationally," he told the audience. "But the "recovery itself is going to be a lower slope recovery than maybe some others have been. And in that regard, it's probably not to going to be a straight line for the fact that this was a supply-based downturn and...relatively low demand growth overall..."
Belmont County farmers Lova Ebbert and Larry Cain work their fields daily, just as they did before receiving significant checks for Marcellus and Utica shale drilling on their property a few years ago. These farmers continue growing a variety of crops south of Bethesda, including corn, hay and tomatoes. Ebbert also raises beef cattle, while Cain raises dairy cows. Betsy Anderson, organization director for the Ohio Farm Bureau, acknowledged some farmers made adjustments upon receiving significant checks for their oil and natural gas deals. 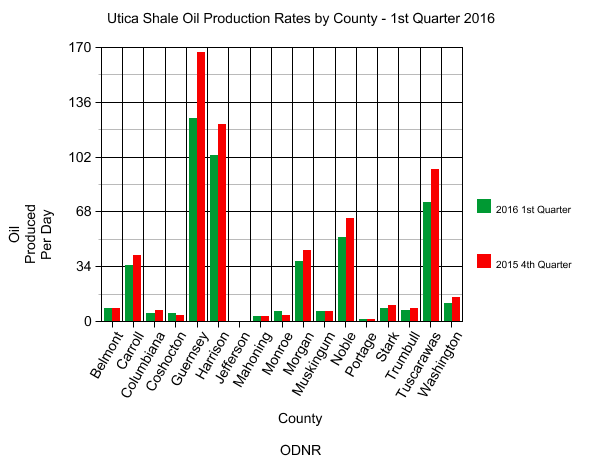 The latest weekly report from the Ohio Department of Natural Resources shows another slow week in Utica shale permitting. Just two new permits are listed, both for Chesapeake Exploration in Jefferson County. The Utica rig count is 11. 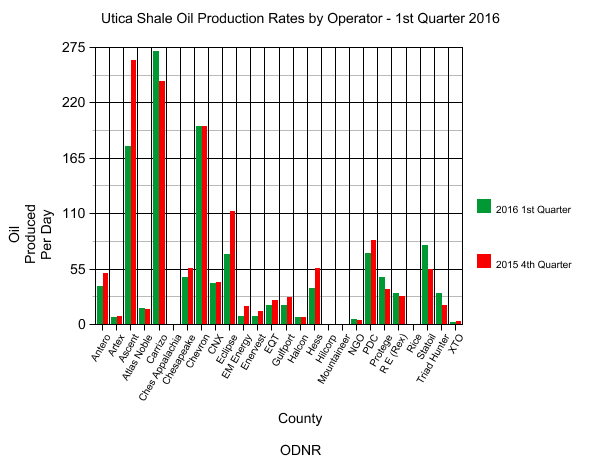 The Ohio Department of Natural Resources has now released the production data from the Utica shale for the first quarter of 2016. As always, we are going to give you a look at how the numbers compare to past quarters, past years, and how they break down among the various drillers who are active in Ohio and the counties where they are drilling. We also have the top 10 oil and gas wells detailed below. The latest production figures give the clearest view yet of how the downturn in oil and natural gas prices has affected production, with oil production declining from the previous quarter for the first time since the Utica shale boom began. The prevailing trend continued with oil production, as the rates per day in production and per well continued to fall - this time to levels we haven't seen in a couple of years. 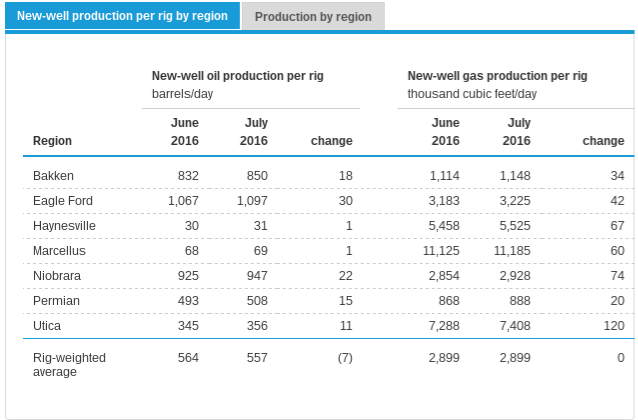 Gas production continues to be on the rise, though, reaching new peaks both in total production and in rate of production. This represents the most even division of top-producing oil wells across different counties we have seen in a while. Guernsey County had 3 of the top 10 wells in the fourth quarter of 2015, but is back to having 4 this time. As has been the pattern on these production reports, Rice Drilling and Belmont County dominate the top gas-producing wells. Click here to download the spreadsheet containing all fourth quarter production data. "During the first quarter of 2016, Ohio’s horizontal shale wells produced 5,485,854 barrels of oil and 329,537,838 Mcf (329 billion cubic feet) of natural gas, according to figures released today by the Ohio Department of Natural Resources (ODNR). Quarterly production from the first quarter of 2016 shows a significant increase from quarterly production from the first quarter of 2015. 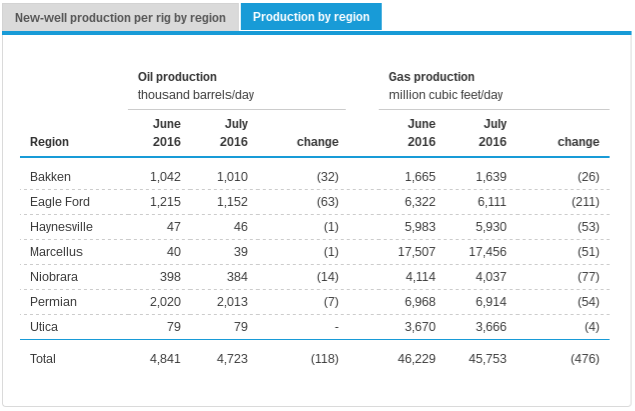 The average amount of oil produced was 4,213 bbls. The average amount of gas produced was 253,101 Mcf. All horizontal production reports can be accessed at oilandgas.ohiodnr.gov/production. Ohio law does not require the separate reporting of Natural Gas Liquids (NGL) or condensate. Oil and gas reporting totals listed on the report include NGLs and condensate." We will break down the data in our typical fashion in a later post, but a couple of quick notes: for the first time since the Utica shale boom started, oil production declined from the previous quarterly report. In the 4th quarter of 2015 there were 6,249,116 barrels of oil produced. Natural gas production did increase from the previous quarter. Stay tuned for an in-depth look at the numbers tomorrow! Gas & Oil: Utica Shale Academy Has Second Graduation - "The number of graduates is growing at the Utica Shale Academy. Members of the Utica Shale Academy Board of Directors was to confer degrees to 18 seniors during commencement on May 26, preceded by a dinner for the graduates and their families. Keynote speaker will be Rhonda Reda, executive director of the Oil and Gas Energy Education Program and Ohio Oil and..."
Alice-Echo News Journal: Oil and Gas Recovery in the Horizon - "Expect a rise in the oil and gas industry by the end of this year is what experts from Invesco shared during the Fifth Annual Eagle Ford Consortium in San Antonio. Darrin Turner, Managing Directors with Invesco who performs quantitative and fundamental research on real asset securities addressed the consortium about the future of the..."
Press release: Antero Resources to Acquire 55,000 Net Acres in the Core of the Marcellus Shale - "Antero Resources Corporation (NYSE: AR) ("Antero" or the "Company") today announced that it has signed a definitive agreement with a third party to acquire approximately 55,000 net acres in the core of the Marcellus Shale for $450 million. Approximately 75% of the 55,000 net acres contains dry Utica rights. The acquisition includes undeveloped properties located primarily..."
The Motley Fool: Has Oil Risen Too Far Too Fast? - "Crude oil has been on a remarkable run since bottoming out earlier this year. After crashing into the mid-$20s to start the year, crude has rocketed higher passing $50 a barrel this week despite the fact that OPEC hasn't done a thing to help the oil market. Instead, what has fueled crude's surge is a combination of..."
Food & Water Watch: Activists Deliver 90,000+ Petitions Calling on DNC to Add Fracking Ban to Party Platform - "A coalition of climate and environmental justice groups delivered over 90,000 petitions to the Democratic National Committee demanding that a ban on fracking be included in the party platform. The DNC platform committee is holding a public forum to receive input on this year’s platform today in Washington D.C. Petitions were collected and delivered by Food & Water Watch, Climate Hawks Vote, Environmental..."
Forbes: In Some Corners of the American Oil Patch, $50 a Barrel Really is the New $100 - "Oil is back at $50 a barrel. Militant attacks in Nigeria have cut that country’s oil output to a 20-year low. China’s output is collapsing. Even OPEC sees the world oil market tipping into undersupply this year. All of a sudden things are looking up for America’s frackers. A few American companies are feeling good enough about their prospects that they’ve even put drilling rigs back..."
Gas & Oil: Do I Need More Than Insurance to Protect My Oil and Gas Interests? - "I have had a number of clients ask me if insurance is enough to protect their real property interests and specifically their oil and gas interests. I agree that insurance should be your first line of defense, but is it enough? In many cases in order to achieve proper asset protection, insurance must be used in conjunction with a proper legal entity, such as a Limited Liability Company (LLC). The question becomes “does the insurance I have or what I can buy, sufficiently protect..."
Seeking Alpha: Prepare Yourself for a Clinton/Sanders Fracking Ban - "We still aren't exactly sure why we did it but we went ahead and followed Donald Trump, Hillary Clinton and Bernie Sanders on Twitter (NYSE:TWTR). Since we did that, we have been bombarded with a lot of, well, let's call it information. Investors might want to pay attention to what Clinton and Sanders are saying. 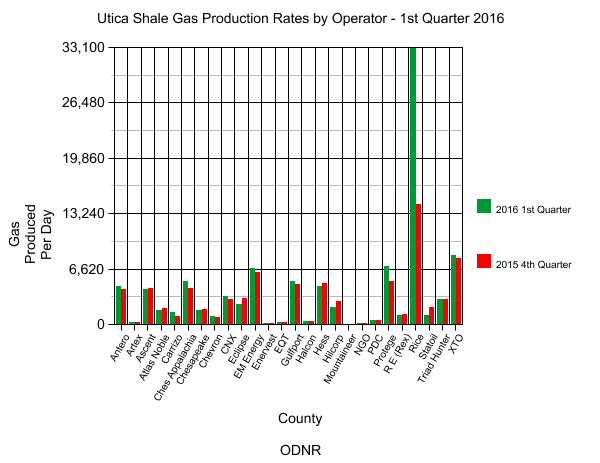 They both have fracking directly in their..."
Market Realist: Utica Shale's Natural Gas Production Rose 46% in a Year - "According to the EIA (U.S. Energy Information Administration), the Utica Shale in eastern Ohio has become one of the fastest-growing natural gas–producing regions in the US. 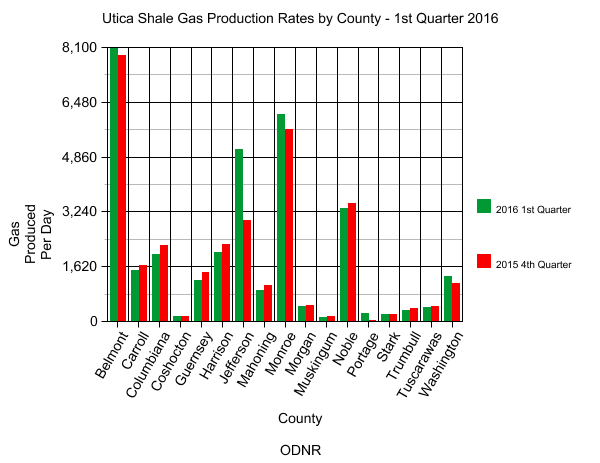 In its Drilling Productivity Report released on June 13, 2016, the EIA estimated that the Utica Shale’s natural gas production reached 3.7 Bcf (billion cubic feet) per day in..."
The Medina County Gazette: NEXUS Contracts Awarded for Pipeline - "A Texas-based company has awarded four contracts for the construction of a proposed 250-mile pipeline that includes a portion of the route through Medina County, a company spokesperson said. The awarding of the construction contracts in February for the proposed NEXUS Gas Transmission Pipeline comes in advance of an awaited approval from the Federal Energy Regulatory Commission on the $2 billion..."
Press release: Leading Proxy Advisory Firm ISS Recommends Williams Stockholders Vote “FOR” the Merger Agreement with ETE - "The Williams Companies, Inc. (NYSE:WMB) (“Williams”) today announced that Institutional Shareholder Services (“ISS”), a leading independent proxy voting and corporate governance advisory firm, recommends that Williams stockholders vote “FOR” the merger agreement with Energy Transfer Equity, L.P. (NYSE:ETE) (“ETE”) at Williams’ special meeting of stockholders scheduled..."
FX News Call: Natural Gas Prices in U.S.: Large Stockpiles Choking Price Rally - "Recovery in US natural gas prices has been hit by heavy stockpiles. On Wednesday, natural gas July delivery settled 0.9 percent, or 0.3 percent down at $2.595 a million British thermal units on the New York Mercantile..."
Akron Beacon Journal: Kinder Morgan Provides $15,000 to Wooster YMCA - "The YMCA of Wooster on Wednesday got a $15,000 gift for its youth fitness program. The grant for a new climbing room at the recently renovated gymnastics center came from Texas-based Kinder Morgan, a giant pipeline conglomerate. The company is building a cross-Ohio pipeline for..."
Press release: OPEC Income Drops from $753 Billion to $404 Billion, EIA Says - "For 2015, the U.S. Energy Information Administration (EIA) estimates that members of the Organization of the Petroleum Exporting Countries (OPEC) earned about $404 billion in net oil export revenues (unadjusted for inflation). This represents a 46% decline from the $753 billion earned in 2014, mainly as a result of a precipitous fall in average annual ..."
Marcellus Drilling News: Deloitte: Drillers Face a $2 Trillion Funding Gap Next 5 Years - "Consulting and accounting powerhouse Deloitte has just issued an important new report that sounds the alarm that upstream (i.e. drillers) are not spending enough money to replace proved reserves. Deloitte says there is a “funding gap” of $2 trillion over the next five years! Natural gas is more at threat than oil, because natural gas “reserves shortfall is bigger than oil since the commodity is yet to see its best years of demand growth in the..."
Bloomberg: EPA Fracking Report Needs Qualifiers, Scientists Say - "A much-debated summary on the risks posed by hydraulic fracturing to drinking water was kicked around again June 14 by scientists discussing recommendations to improve an Environmental Protection Agency report. The EPA draft report said it found no “widespread, systemic impacts” on drinking water..."